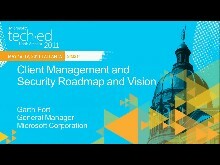 Learn about Microsoft’s end-to-end virtualization strategy - from the desktop to the datacenter to the cloud. In this overview session we review how Microsoft virtualization products/technologies can be used to solve today's core IT issues (reduce TCO,increase application availability,improve business continuity,establish sustainable computing),deploy new computing models (desktop virtualization),and build a foundation for a more dynamic IT environment (private cloud computing). Product overviews and demos cover Microsoft’s desktop (Virtual Desktop Infrastructure,RemoteFX,App-V) and server (Windows Server 2008 R2 Hyper-V,Dynamic Memory,Microsoft System Center Virtual Machine Manager) virtualization technologies. Failover Clustering 101: Get Highly Available Now!